How to Get Your Emails Read by Influencers! 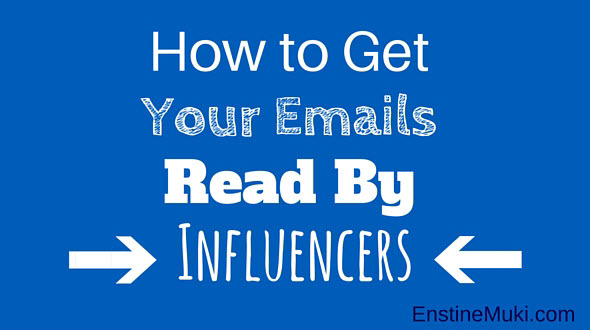 →How to Get Your Emails Read by Influencers! You write great content, you have a decent following but you don’t seem to be making much headway. If only you could connect with someone important. We all know that we can’t get there by ourselves, we need people. Here’s the thing though, we need important people who have that audience we don’t. We need to get in front of someone who matters, we need to make those all-important connections but how exactly do you do that? It can start with something as simple as an email but what do you say and how do you get them to open yours? That’s where John Corcoran comes in the picture. Who is John and how can he help you with this? I’m going to let Adrienne answer those questions for you. -> Hey Adrienne, you and John Corcoran are planning a Live Online Event on Tuesday, December 8th. Kindly tell us what this is all about and why you think it’s important. You know I’m really big on making those important connections and building relationships with people Enstine. I personally teach others how to build their blog communities but what if you’re really eager to get in front of an influencer or a VIP! The best way to accomplish this is via email. The problem with email is that people are busy, especially those who are already very successful. You’ve really got to grab their attention so they’ll want to open your email and it’s not an easy thing to do. Not for us though but it sure is for John. He’s got some pretty simple “tricks” you can use to ensure you get a response every time even if you’re sending a “cold email” to a busy VIP. The 5 things you MUST do if you want your emails to be opened, read and responded to by VIPs you admire. How to go from getting your email opened to building a genuine relationship. How to go from a genuine relationship to building your income based on these relationships with VIPs. John will also share 5 of his best email templates you can use to connect with the VIPs you want to build relationships with. -> Ok most of my readers are familiar with you and what you share but who is John Corcoran and why should we care about listening to him? I met John earlier this year and he has a VERY impressive background. He’s a former writer for the Clinton White House administration and John knows how to connect with influencers and VIPs using email. In addition to the White House, he’s worked as a Speechwriter to the Governor of California, for Steven Spielberg at DreamWorks SKG, and even worked with startup entrepreneurs in the heart of Silicon Valley, right across the street from eBay. Who better to learn from than someone with his background and proven success record! -> Who is this event for and what should participants expect at the end of it? This event is for anyone who is serious about taking their business to the next level. John has a proven track record for working with some very powerful people and he knows how to get their attention. It’s up to us to form those connections and move to that next level. We have to get our foot in the door first though. John does have a course he’ll be promoting but as I mentioned above he’ll be giving away 5 of his best email templates you can use to connect with the VIPs you want to build relationships with. -> How much does it cost? John’s course has two different levels. Level one is a one-time fee of $297 or he has a payment plan option. Level two is the Elite course which is a one-time fee of $397 and this one has a payment plan option as well. He also offers personalized coaching sessions for those who would like to work with him one on one. It will be recorded if you can’t make the actual webinar but remember, you won’t get his advice or those templates without registering so be sure to do that now. Thank you Enstine for letting me use your blog to share this exciting news. It’s my first webinar by the way and I’m so honored that John will be sharing this great information with us all. I’m more than eager to learn even more about how to get in front of the right people and grab their attention every single time. That’s some exciting event to crown this year, Adrienne and I’m so excited that you stopped by my blog to share details about it with my readers. Hey people, this is something that will help us start the new year 2016 in a big style. We know the importance of connecting with people that matter in society and John is the right gem to show us how. If you have some questions to ask Adrienne or John, or you simply want to share something with them, please drop your comment below. Let’s give Adrienne a boost. Share this post on social media. Who doesn’t want to learn how to reach influencers and get our emails read? Anyone who is serious about growing a business knows we can’t do it alone and reaching our target audiences is vital to our success. I have been blessed by Adrienne to be a contributor to her blog and I can say that she is a true influencer. When she asks her audience to do something they do IT! Through her I’ve made some great introductions. Who wouldn’t want to meet a bunch of “Adrienne’s”. I will be on the webinar and I’ve already registered. It’s going to be eye-opening. We all have a lot to learn. I wish I could be an expert in everything but unfortunately I’m just not. I’m looking forward to learning from Adrienne and John! Good to see you here and thanks for sharing this article on social media. You see Don, by constantly reading Adrienne’s blog, I have been connected to many important people and my business has been hugely improved. When she talked to me about this event, the first thing I did was jump on board because I know both Adrienne and John and going to pour out real value. We shall all be there together, buddy. Do have a wonderful weekend and we look forward to the live event. Thank you Don and I’m glad to hear you’ll be attending the webinar. As you know it’s my first but what a powerhouse I grabbed to help me with it right! I mean what John shares is amazing and I’m eager to learn myself and share this with my audience. Think how we each can improve as we head into a new year. Thank you for your continued support and I’m so very blessed to know you my friend. Enstine really helped me get the word out too so I’m so very thankful. You two have a great day okay! Thank you SO much for having me and letting me share this exciting information with your audience. I KNOW how important it is to connect with others just to continue growing our business. For some it’s a very slow process so if you could actually be doing a lot of that with some very influencial people along with VIPs then just think where your business could be at the end of 2016. I’m so excited about what John will be sharing and I do hope that everyone who is interested will hop on this webinar and check out the tips he has to share with us. We’ll definitely have a hand up on some of the others this way. Thank you again and I’ll see everyone next week. O yeah Adrienne I can see a lot of value packed into this one so it makes sense to be part of it. Thanks for letting me know about this – I’ve registered, although I might end up watching the replay because of family commitments, but it’s sure to be packed with valuable info. Have given it a push on social media, of course! Thank you Joy, I know it will be worth your time and I also know we all lead busy lives which is why I LOVE replays. I so appreciate your support, thank you my dear. The good thing with webinars is that everyone can always catch up with replays 😉 so it’s exciting to hear you’ll still be there after all. Sounds like a cracking event. I’ve visited John’s blog a few times and read some of his guest posts and he does come across as a highly knowledgeable and personable man. It’ll be good to hear what he has to say, so thanks for letting me know about this webinar. Like anything, you have to give first. And emailing a VIP at any time, it’s always best to know what that VIP wants first so you can tailor your email’s message to that. If you sound like you know what they want most and offer a way to help them get it, then you have a much better chance of their taking notice and reading your email. It’s about putting them and their needs and wants first. Most emails get ignored because the people sending them forget about this. So beautiful to see you here and thanks for adding to the conversation. Do have a wonderful weekend, buddy and hope to see you around again. I’m glad you’ve come across John before and he’s actually a pretty cool guy. I was very intimidated at first but after our initial conversation on Skype, wow. He’s really accomplished a lot in his life and I know what he has to share will really help a LOT of people. You’re right though that it all has to do with your approach and knowing what their needs are. Just sending a generic email isn’t going to cut it but I’m sure John’s going to give us some great tips in this area. Thank you for the comment Tom and support, I’m really excited about this one and can’t wait to hear what John has to share with us all. This sounds like it’s going to be right up my alley. I remember Adrienne talking about her first Webinar about a month ago and I knew then it was going to be a real interesting one. Thanks for sharing and I just signed up for it! Oh wow, thanks Sherman and yep. This is my very first one and I’m so nervous but John has really put me at ease, he’s such a nice guy PLUS he really knows his stuff and is very successful in this area. Because of how big I am as well with building relationships I thought this would be a fabulous webinar to share with my friends. I think I’m in great hands with this. Thanks for signing up and wish me luck now. I like this topic and am always wanting to improve the way I communicate especially via email. I note the timing and see that it’s very US centric which is a pity, but I have registered so at least I can receive the recording. I think that’s going to be 8pm my time and it’s perfect time for me to be part of it 😉 However, the replay is great for participants who may not be able to attend live. In any case, I’m sure there is going to be great value for us. Yeah, darn us for living in the United States! lol… We can’t please everyone of course since we are all scattered all over this fabulous world. But that’s why we LOVE replays, we can watch them the next day. Thank you for your interest, I KNOW you’ll enjoy what John will be sharing and I’m so excited to learn from him too. You have a wonderful weekend Kim and thanks for the visit. See you next week. as last time a read your another guide to increase email subscriber by providing some stuffs free of cost for readers . but now this time you have shared really awesome and helpful guide. It will be very powerful method to get read your email ! and helpful to get conversion in selling something product or marketing. We ALL love to learn things for free, me included. If we all only shared information for free though then we would never be able to make a living which is why I can appreciate what John will be sharing with us because he’s going to give us some great tips that he uses and opens a lot of doors for him. Plenty of others as well of course who have purchased his course, done the work and also have gotten great results. Thank you and enjoy your weekend. I wanted to clear one thing here. Has the webinar been held or it will take place now? I am in little bit confusion with it. You can clear this one.. It states above Nikhil that the webinar will be held on December 8th which is next Tuesday. You still have plenty of time to sign up and I hope you’ll want to check this one out. Very impressive and thank you for sharing this news with us! Emails are very effective .. And the real effectiveness are checked on Black Friday and Cyber Monday (not it has to be sell-y but an interesting and powerful title can mean to increase the chances of opening it). Emails are definitely still effective, I agree but they don’t have to be salesy at all. I’m really excited about what John will be sharing and I can’t wait to hear what he has to teach us. Thank you for signing up and I’m really excited to be hosting my very first webinar with such a fabulous and talented guy. I’ll see you on the 8th. Just acquiring a VIP email address is a task seldom completed by most bloggers. Building an email list by using the means available is often hit and miss…. So divulge the secret of acquiring VIPers, then tell us how to get them to open our emails. Subject for an add on webinar! Times but most if the times they don’t read it. But now i think they will do it. I’m not much upto this article before. Today i got some idea about Email Action. Thanks for the support Entine Sir. Another great post you have shared with us, I really enjoyed to read this post becuase its totally new thing for me and when I learn new thing in internet, I feel very happy and that’s why I praise to other person.